Ultranomics –The vast majority of ultrasound sonographers require treatment for Musculoskeletal disorders caused by repetitive, improper ergonomics while at work. We are using real time video motion processing and wearable motion sensors to monitor and log the kinematics of sonographers’ neck and shoulder continuously throughout ultrasound procedures. A GUI displays a graphical representation of ergonomic quality to the sonographer, while quantitative data is saved for further analysis. The information from our ergonomic monitor will identify habits of pathological movement, elucidate the source of injury, and assist with guiding preventative measures. 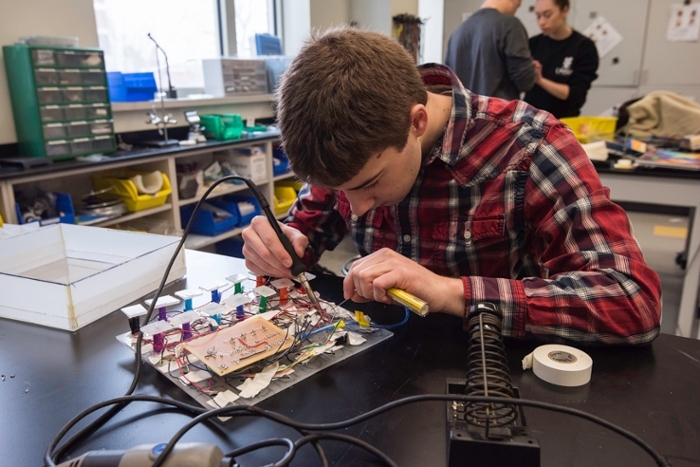 Jacob Parisi, a senior in Biomedical Engineering, works on his team's senior design project, to create a medication dispenser integrated with the current TouchStream scheduling system. Photo by J. Adam Fenster/University of Rochester. TouchStream Solutions Medication Management - Our project addresses the problems identified by TouchStream Solutions with the current pillbox for use with their medication scheduling system. We created a medication dispenser integrated with the current scheduling system that can be customized for various medications and customer needs for patients including individuals with mental disabilities and those above age 65. This medication dispenser will help improve customer interaction with the TouchStream system, assist customers with the management of daily medications and reduce instances of incorrect medication doses. Team BAXTER – The height of an intravenous bag in relation to the attached infusion pump is capable of impacting the amount of medicine the system delivers. If the height difference is inappropriate, the scenario has potential to lead to lower success rates for treatments and further complications. By developing a mechanism to ensure that the height is consistently within a tolerable range of the ideal value, we aim to increase accuracy of infusions and reduce the risk to patients from incorrect dosages. ECG LeadURs - We aim to design an ECG lead wire that is capable of providing reliable ECG signals by connecting to tab and stud electrodes securely. The lead wire connection must be inexpensive to manufacture, efficient to sanitize, and comparable to market alternatives in ease of use and patient comfort. Most importantly, the ECG lead must increase electrode retention in an effort to minimize the alarm fatigue and inefficient ECG monitoring occurring in clinical settings worldwide. Customer: Theresa Hart, Curbell Medical Products, Inc.
Fetal Cardiac MRI – MRI is the best option for diagnosing potential issues in fetal hearts, as the technology provides high resolution and lacks harmful ionizing radiation. However, MRI is limited due to the inability to measure the fetal heartbeat for selectively timing the image acquisition. By designing a device that can safely obtain an accurate fetal heart rate and communicate this information to the MRI machine without interfering with the imaging process, we aim to improve diagnosis of congenital heart defects before birth. Dialysim - Our product will act as a verification and validation device in a laboratory testing environment for Fresenius’s Dialysis Equipment. It will interface with the hemodialysis system and have the ability to simulate changes in blood pressure, blood temperature, and oxygen saturation and hematocrit. This will allow Fresenius to examine their equipment’s response to changes in the state of our model. Braille Reader Team - Seventy two percent of people with diabetes will develop diabetic neuropathy by their mid-fifties. For individuals who are visually impaired, the onset of severe diabetic neuropathy means they can read neither visually nor tactilely, through the use of braille. Our mission is to develop a device that will translate the braille documents of a person with diabetic neuropathy into an accessible output. Additionally, we envision this device as an aid to non-Braille readers in inclusive educational and workplace environments. TripP: Primate Positioning People - We aim to design and fabricate a new head positioning apparatus to be used for retinal imaging in primates for the Advanced Retinal Imaging Alliance (ARIA). The apparatus must include precise pitch and azimuth rotation about the pupil, a safe way to position the primate, improved stability, and the ability to interface with ARIA’s imaging systems. D.A.N.I. (Dynamic Anthropomorphic Innovation) Phantoms – Carestream Health, a provider of radiography equipment, has expressed difficulty assessing the performance of its imaging equipment using conventional radiographic phantoms. As such, this project was established to perform modifications to an existing phantom to measure dynamic latency, simulate flow and show sufficient contrast between flowing substances & surroundings. The Pot Skirt team tests their prototype. From left, YeJin Jeong, Nikki Sroka, Jessica He, and Adam Langenbucher. Photo by J. Adam Fenster/University of Rochester. 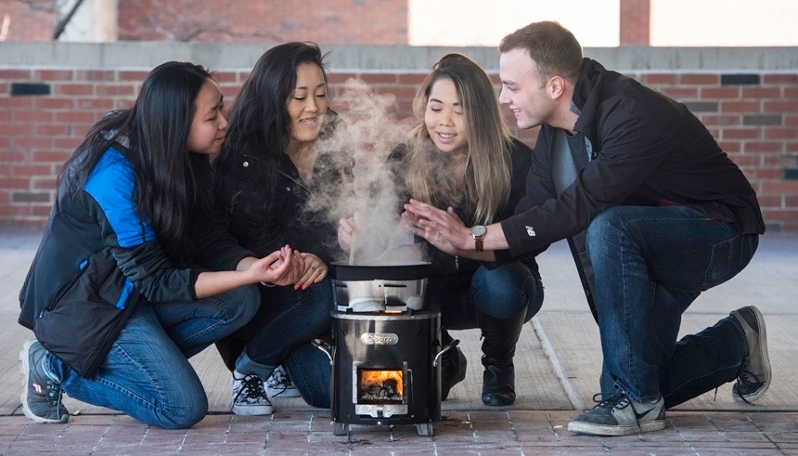 Pot Skirt Team – Due to dangers in deforestation, toxic byproduct emission, and financial strains for families in Kenya, there is a strong demand for pot skirts that can increase fuel efficiency by improving convective heat transfer in cookstoves. Consumers have also requested that the pot skirt be adjustable to several pot sizes. In correspondence to these customer needs, we have created a pot skirt design that is safe, cost effective, fuel-efficient, adjustable and is compatible with the upcoming line of wood-burning BURN cookstoves. Vestibular Vibes - Benign Paroxysmal Positional Vertigo, BPPV, is a condition caused by detachment of otoconia (calcium carbonate crystals) from the otolith organs and subsequent migration of otoconia into the semicircular canals. Presence of these otoconia creates a false sense of acceleration in the patient by stimulating the vestibular hair cells, thus causing nausea and vertigo. Therefore, we intend to design a vibrational device that can be applied to the mastoid of the patient in order to deliver oscillations capable of breaking apart the clumped otoconia. Wrist Support Team – Individuals with wrist paralysis struggle with daily tasks that involve the manipulation of their environment and subsequently rely heavily on others for help. We have created a line actuated wrist brace that allows the user to perform a lateral pinch. Scoliosis Brace Compliance – For adolescent Idiopathic Scoliosis children between the ages of 10 and 15 years old, bracing has been shown to be effective at stopping curve progression and preventing unnecessary surgery. Due to low compliance, only a fraction of children get the full benefit of bracing. Our group seeks to increase patient compliance & thereby bracing efficacy by addressing patient concerns with current braces & bracing techniques. Endosign – Gastrointestinal endoscopies are the most frequently performed outpatient procedure in the United States, and the country’s aging population calls for a more efficient procedure. The procedure requires a gastroenterologist to feed biopsy forceps through the endoscope channel and back repeatedly, which is unnecessarily time consuming. The goal of our project is to reduce the passing time of the forceps through the instrument channel of the endoscope. efficiency of the nerve block procedure by replacing the second anesthesiologist with a footcontrolled syringe pump and thus reducing the procedure to a one-person job. "ScoliFit": Our mission is to help orthotists create the optimal brace for each patient’s unique spinal curvature. ScoliFit is a wearable torso-positioning device designed for use on adolescent idiopathic scoliosis patients. This device can determine the torso position that immediately reduces a given patient’s spinal curvature and enables orthotists to incorporate that position into the profile of the patient’s final brace. Since the current method of making braces is subjective and has no such capacity for validation, ScoliFit is unique in its ability to establish the optimal brace design before the brace is made. Advanced Medical Draining Technologies: We are developing a product to be used in conjunction with surgical drains in order to improve fluid removal from post-surgical cavities after invasive procedures, which will reduce the incidence of costly surgical site infections. The device consists of a porous, bio-absorbable mesh, allowing for tissue ingrowth, with a drain pattern throughout. It is placed during patient closure, functions while the drain is in place and then degrades over time. Novel 3D printing technology will be utilized. StimSense: Our device aims to quantitatively monitor levels of neuromuscular blockade in patients undergoing surgery. Neuromuscular blocking drugs are used as muscle paralytics to prevent patients from reacting to surgical stimuli. Currently, anesthesiologists subjectively monitor dosing of neuromuscular blockade. Our device objectively monitors neuromuscular blockade throughout surgery to guide proper dosing, reduce post-op complications and achieve better recovery. Intelligent Cooler Enterprise (ICE): Our mission is to create a more robust device for blood transportation within hospitals while decreasing the workload of employees. Our insulating device can measure the temperature of its contents and keep blood within the regulated temperature range significantly longer then the current system. Our product can also connect to a network so that we can notify personnel of unexpected temperature events, and in turn create a safer, more efficient hospital for patients that may be at risk for transfusions. Customers: Diane Bullock Medical Technical Specialist, BloodBank-Clinical Labs, UR Medicine and Deborah Masel, Blood Bank-Clinical Labs Chief Supervisor. 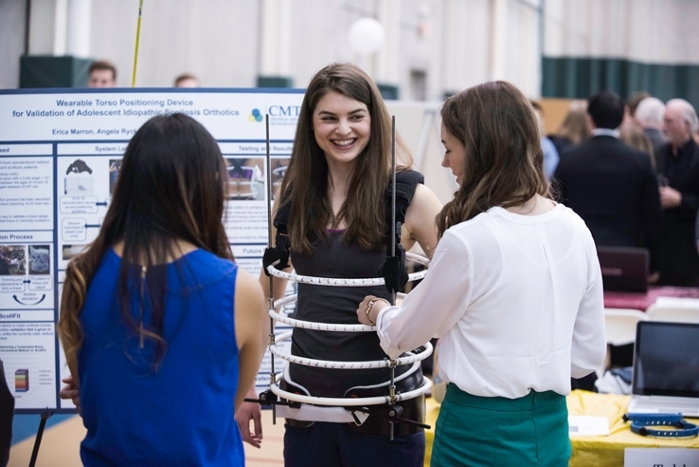 For a full list of Hajim School of Engineering Design Day Projects, click here.